Pharmacology, Toxicology and Biomedical Reports,2017,3,1,1-6. 1College of Clinical Pharmacy, Dept. of Pharmaceutical Sciences, King Faisal University, Al-Ahsa, Saudi Arabia. 2College of Medicine, Microbiology Division, King Faisal University, Al-Ahsa. Saudi Arabia. Background: The unique position of community pharmacist (CP) particularly in the developing economies places them at the forefront of pharmacovigilance. The need of providing an enabling environment is of importance in encouraging them to report cases of adverse drug reactions (ADRs). This is with a view of minimising inherent risks associated with drug use. The study aims at assessing the knowledge, barrier to ADRs reporting and factors that could improve spontaneous reporting. Methods: A cross sectional study-survey, using a self-structured questionnaire was adopted. The study consisted of pharmacists in community settings. The sample size was determined using online sample size calculator RaoSoft at a confidence of 95%. Out of 150 pharmacists targeted only 40 responded. Results: Majority (92.5%) of the pharmacists had between 1-20 years Community Pharmacy Practice experience. About 40% of them see over 100 patients daily with 17.5% witnessing more than 10 ADR cases. However, 52.5% had not reported encountered ADRs cases, for the past 12 months. 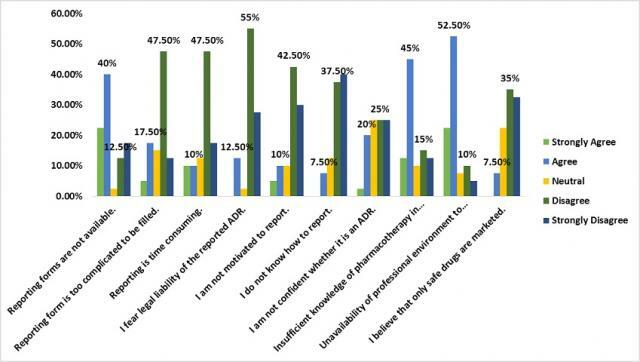 Barriers to reporting included, insufficient knowledge of pharmacotherapy in detecting ADRs (57.5%), lack of reporting forms (40%) and lack of adequate professional environment to discuss issues relating to ADRs (75%). Some of the factors adduced that can encourage and enhance spontaneous reporting were listed as, proper guideline for spontaneous reporting system (SRS) and making reporting obligatory instead of voluntary. In addition, a simple reporting method instituted with regular feedback. Conclusions: Despite having huge turnover of patients and seeing ADRs cases, there appeared to be a massive under-reporting in the area of study. Authors observed that majority of the pharmacists were afraid of being incriminated, due to the high level of self-medication practices encouraged by them.